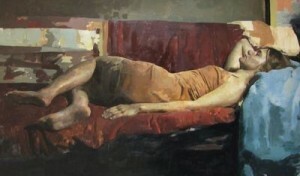 Paint the figure from life with Hollis Dunlap. Students will focus on creating a strong sense of 3-dimensional form by looking closely at light effects, proportions, edges, and various methods of paint application. We will explore a practical use of proportion and anatomy, focusing on major anatomical landmarks, allowing students to study the way that master painters model form and make color choices. Several techniques will be demonstrated, including more traditional underpainting methods as well as direct painting of the lightest and darkest values. Use of contrasting thick and thin paint will be demonstrated in the manner of master painters such as Rembrandt and Rubens, at the same time exploring more naturalistic color effects in the style of 19th century painting. Painters will be encouraged to build the sense of form from the largest masses first, to create a sense of finish to the painting before small details are added. Basic geometric shapes will be used as analogies to various forms of the human body to give the painting a convincing sense of form as well as giving the student more confidence in painting complex figurative work. Please visit hollisdunlap.com to view selections of his work. Instructor Bio: Hollis graduated from the Lyme Academy College of Fine Arts in 1999. While at the Academy, he was the first student artist to be awarded First Prize at New York’s National Arts Club exhibition two years in a row. Hollis was also the recipient of the Academy’s John Stobart Fellowship, awarded each year to a graduating student in recognition of outstanding work. In the winter of 2001, Hollis studied at the National College of Art and Design in Dublin, Ireland. Hollis is represented by galleries in New York, Boston and San Francisco.